Occasionally when using Creately with Google Chrome as soon as the dashboard loads the screen will freeze and it isn't possible to click any of the buttons on the screen on open documents. We are not sure at this stage why this is happening but we have established that it seems to be an issue unique to Google Chrome and the Pepper Flash version of Flash that comes pre-installed with Chrome. If you're having the problem described above as a workaround you can get Creately working in Google Chrome by disabling Pepper Flash and using regular Adobe Flash player. The steps below assume you already have Adobe Flash Player installed - which if you have another web browser installed is very likely - you can check by visiting here: http://www.adobe.com/software/flash/about/. If you don't have two versions of Flash installed as described at point 2 below then you'll need to install the regular Adobe Flash Player from here: http://get.adobe.com/flashplayer/ and once installed on your system make sure you restart Chrome before continuing with the instructions below..
Start Google Chrome and in a new tab type "chrome://plugins" without the quote marks and press enter. 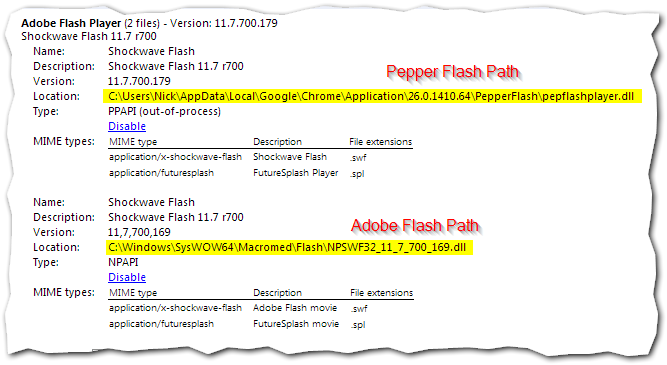 In the image above you can see the Flash player listed first with a location of "C:\Users\Nick\AppData\Local\Google\Chrome\Application\26.0.1410.64\PepperFlash\pepflashplayer.dll" is the Pepper Flash player while the second one is the Adobe Flash player. They are used in the order that they appear in this list so normally the Pepper Flash player will be used. The Pepper Flash player needs to be disabled. You do this by clicking the "Disable" link below it. Once the Pepper Flash player is disabled it will be greyed out with an enable button so you know the Pepper Flash player is disabled. You should now open a new tab without restarting Chrome and visiting http://creately.com/ and load the app again. You should now be able to use it without the dashboard being frozen. If this workaround is successful for you then I would recommend leaving the Pepper Flash player disabled. The Adobe Flash player is very good and so you shouldn't notice any major differences. It should remain disabled between restarts of Google Chrome. Pepper Flash will probably re-enable when Google Chrome auto updates but the next version of Pepper Flash may work successfully so you should try it and if you still have problems disable it again. Which version of Adobe Flash does Creately work with? Having trouble saving in Creately? or Creately behaving strangely.